The score for Netflix’s ‘Iron Fist’ is available to buy digitally and on streaming services. The score for the 13-episode series that brings Danny Rand into Marvel Cinematic universe is 25 tracks long and features all of the original music composed by Trevor Morris for the show. It also features the track ‘Come Down’ by Anderson .Paak off of his second studio album, Malibu. Although they’re absent from the original soundtrack, ‘Iron Fist’ has featured music from the likes of Run The Jewels, Vince Staples, Outkast and Killah Priest. 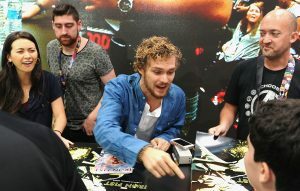 Finn Jones, who plays Danny Rand in the show, recently defended the bad critical reception of the final Defender series on the basis that his character is too similar to Donald Trump. Iron Fist follows Daredevil, Jessica Jones and Luke Cage as the final of Netflix and Marvel’s Defenders which are all currently available to stream on Netflix. The post Netflix’s ‘Iron Fist’ soundtrack now available to stream featuring Anderson .Paak appeared first on NME.